As mentioned above, Demandware is having an incredibly strong day after announcing news that it would be acquired by salesforce.com. According to the agreement surrounding the acquisition, CRM will be paying DWRE $75 per share in order to acquire the company in an all cash transaction. At the price per share offered, the total that will be paid for DWRE comes to a whopping $2.8 billion. The transaction is scheduled to take place during salesforce’s second fiscal quarter of 2017, which will end on July 31st, 2016. Why Would salesforce.com Want To Acquire Demandware? According to several analysts, corporate spending on digital commerce platforms will likely grow at more than 14% annually. This will bring the market value to $8.544 billion per year by 2020. DWRE is currently holding a leadership position in the industry, and it will extend salesforce.com’s leadership role. 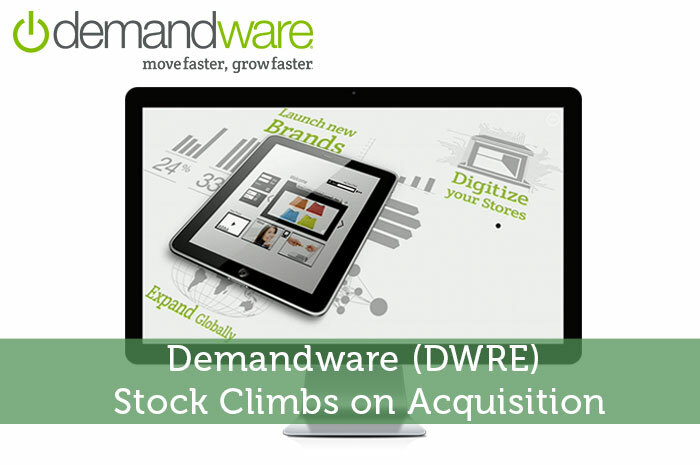 The company is hoping that by acquiring Demandware, it will be in a position to capture the multi-billion dollar digital commerce market using a product that will be called Salesforce Commerce Cloud. The Commerce Cloud will soon be an integral part of the Salseforce Customer Success Platform. The platform will give companies the opportunity to reach out to and connect with their customers in new ways. This is actually a great thing for customers of both companies. As a result of the acquisition, salesforce.com customers will be able to access the industry leading enterprise cloud commerce platform. However, DWRE customers aren’t left out, they will now have access to salesforce.com’s leading sales services. All in all, this is a great move on both sides of the fence. As investors, we know that the news moves the market. Any time there’s positive news released that is associated with a publicly traded company, we can expect to see gains. For DWRE investors, the news that was released was overwhelmingly positive. After all, the acquisition price comes at an incredible premium. As a result, the stock is climbing dramatically in the market today. Currently (12:32), the stock is trading at $74.7 per share after a gain of $26.72 per share or 55.68% thus far today. When it comes to salesforce.com however, things aren’t going quite as well. At this point, it seems as though investors are uncertain as they weigh the cost associated with the multi-billion dollar acquisition. Currently (12:36), CRM is trading at $83.60 per share after a slight loss of $0.11 per share or 0.13% thus far today. Moving forward, I have an overwhelmingly bullish opinion of what we can expect to see from both DWRE and CRM. The reality is that the acquisition that was announced today is a match made in heaven. Both companies compliment each other incredibly well. This will likely lead to long run gains on both sides of the fence. Where do you think DWRE and CRM are headed moving forward and why? Let us know your opinion in the comments below!